It’s hard to believe that we are already 7 weeks into the school year. For me it has definitely flown by! So far there hasn’t been a day where I have felt inconvenienced by the fact that I am the teacher or regretted our decision. Although some days I find myself praying that I am doing a good enough job. I also have become very grateful for step by step lessons especially for phonics and reading. There is no doubt in our decision in not sending Kolbe to a traditional school this year. I find peace in knowing that this is definitely the best fit for our family, even on the hard days. It is such a privilege to be able to have this time with him. There are so many days while in the midst of teaching my heart is filled with gratitude for the ability to teach my sons. Don’t get me wrong we have had our difficult days especially trying to establish that although I am just mom I am also the teacher, which means trying our best at school and focusing. I have also had moments finding myself saying I am only doing kindergarten, I don’t think I am cut out for this. Homeschooling gives me the ability to take the time to ensure Kolbe is comprehending all of the material, as I am finding there are words or instructions he doesn’t understand yet. I also love being able to go at his pace. 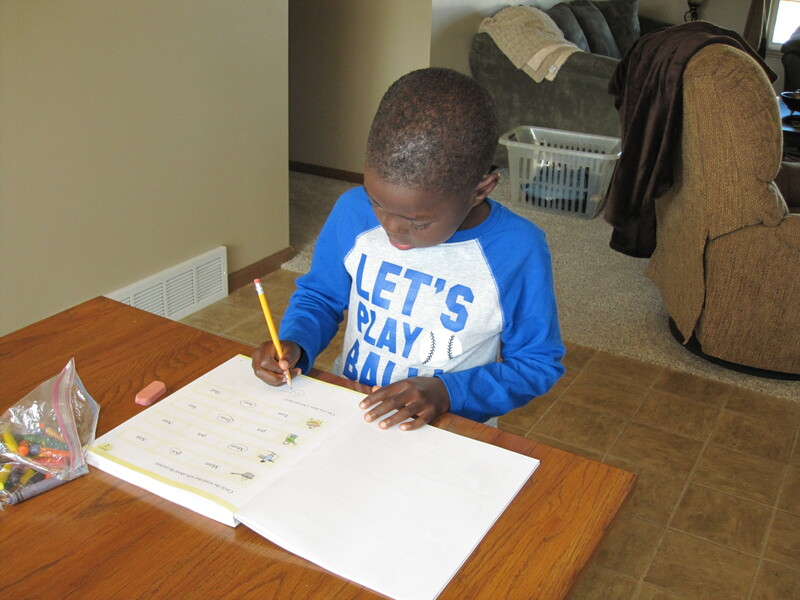 He is catching on incredibly fast to reading and spelling, but we usually spend a little more time on math. I have also learned homeschooling is like a 2 for 1 deal. It is amazing to see what Ethan is picking up just by being in the same room while I teach Kolbe. I also love to see his eagerness to learn and want to start reading because his big brother is. Although Kolbe is only 5 I try not to go out any where much until 2:00 or 3:00, because I hate the stares as people wonder why your child isn’t in school. I learned the hard way when a grocery store clerk asked why my son wasn’t in school. I quickly answered that we homeschool and pushed the cart a little faster. My answer was met with silence. Of course I have also had a few laughs at people’s reaction. We were at the park last week and a grandma was there with her grandson. She asked what school my sons go to and then proceeded to tell me about a distant relative she knows who homeschools and that she is probably Amish. And so the stereotypes begin and it probably won’t be the last. I’m Amish and I send my kids to public school. The stares I get! Remember they look on the outside and God looks at the heart—go shopping whenever you need to. People will find something to be judgmental about. I receive judgmental looks for my daughter not being a good walker (she wears orthotics and does physical therapy), for giving her tea (it’s herbal people), etc. There is always something. I guess it makes some parents feel better to judge others, but you never know what is going on. Keep being awesome! Thanks! So true there will always be something. Homeschooling is tough but the payoff is so worth it. It won’t be long before you hardly notice people’s stares. If they balk or make a rude comment, I sometimes respond with something really obnoxious like “My children are exceptionally smart so if I homeschool they are able to finish one grade quickly and then go on to the next. My first grader can already comprehend long novels like Lord of the Rings and enjoys basic algebra. School would only hold them back.” I should be more charitable, but it is backwards that we are the weird ones because we want to put so much effort into the education of our children. I highly recommend joining a homeschool group. When all your friends homeschool too you forget that it’s not the norm. Haha, love your response…I may need to try it! Thank you for the prayers, baby girl is doing great! At my follow up they still found a very small abruption,so taking it easy. Bedrest, I didn’t know you were on bedrest…praying! !